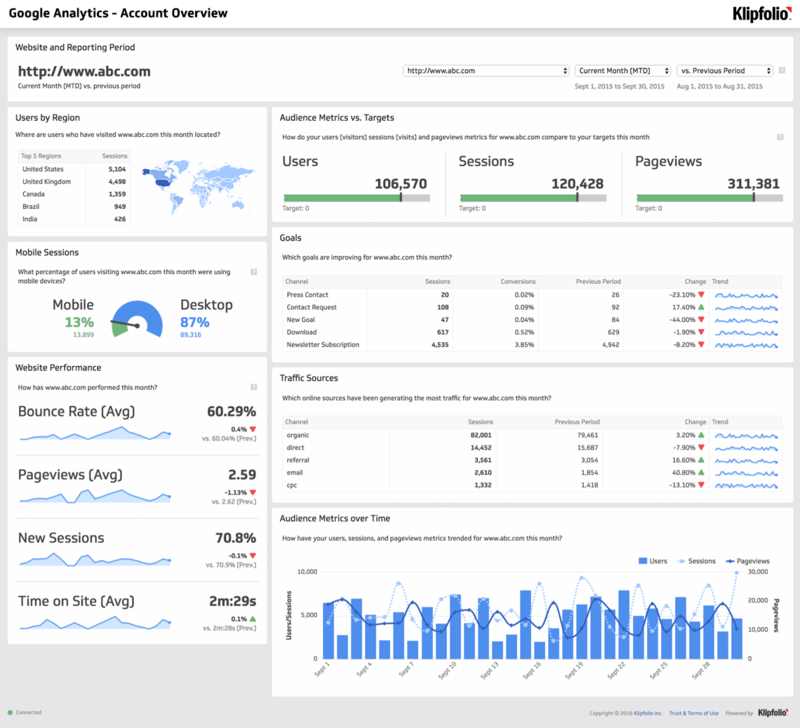 What is a web analytics dashboard? 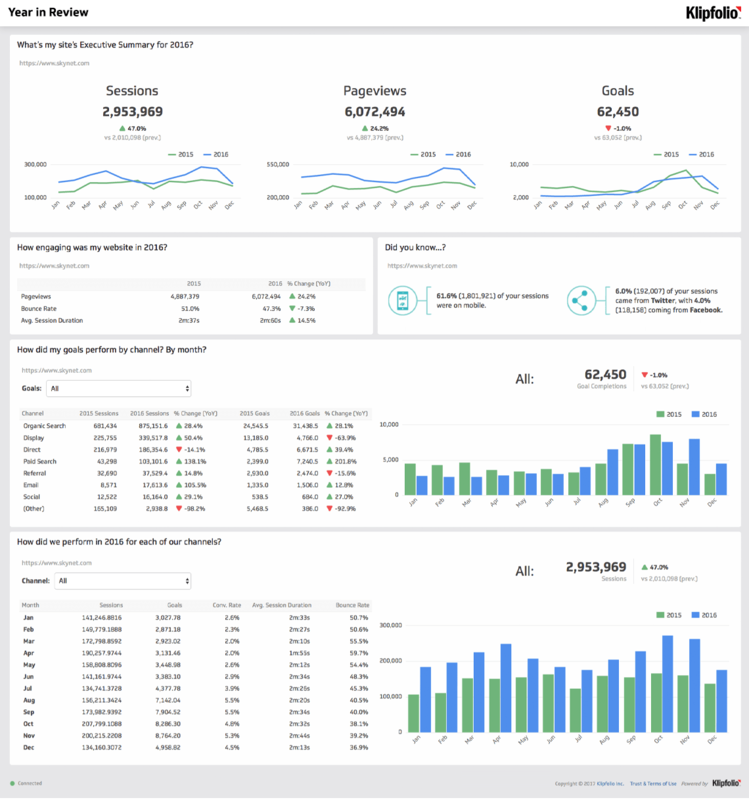 A web analytics dashboard is a reporting interface that allows you to monitor your website performance by tracking metrics like visitors, pageviews, and online conversions. Web analytics software is an important tool for webmasters, as it allows them to collect, measure, and analyze data for their website. Webmasters will install this software on their website to automate data collection. The most popular web analytics software is Google Analytics. It’s free, easy-to-use, customizable, and powerful. A web analytics dashboard may be used in many different contexts such as digital marketing, social media, SEO, UX, and ecommerce. Each of these use-cases brings a different perspective to website performance. For example, an SEO will want to ensure that his website is maintaining a healthy volume of search engine traffic, while an ecommerce professional will want to ensure online sales are high. Why build a web analytics dashboard? The benefit of a web analytics dashboard is that it allows your entire team to monitor your website performance. While many marketers and webmasters are quite proficient at using Google Analytics, others on your team may be unfamiliar with that tool. 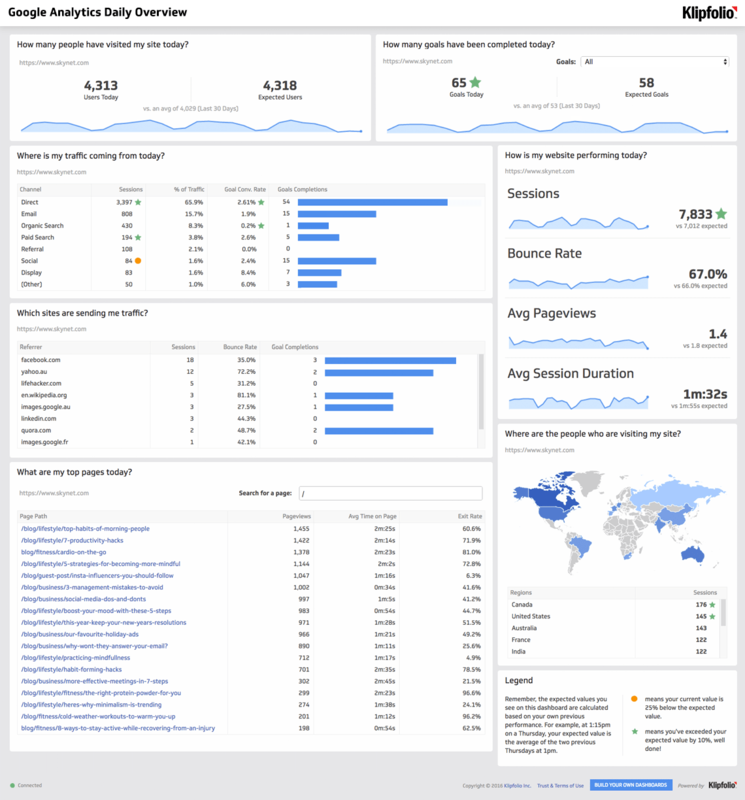 A web analytics dashboard provides a mechanism by which to share website insights in a concise, simple way. Curious what the best way to display your web analytics dashboard? Check out these examples. If you’re an inbound or digital marketing professional, your website marketing dashboard helps you articulate how you are performing on a daily basis. If you need to report on your website’s performance on annual basis, consider a simple interface an infographic appeal and interactive menus. If you need to share your website performance with a large group, it’s often best to provide a simple view of your website performance. A web analytics dashboard let’s you track the performance of your website in real-time, and answer the critical question, "how is your website performing with respects to your marketing objectives?" This dashboard example focuses on a high-level, yet in-depth view of your website's performance across multiple timeframes. Some of the metrics from this dashboard are also featured on the SEO performance dashboard.